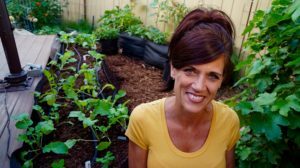 Home » Blog » Fall Gardening: Cool Weather Veggies, What are They, How to Plant? Fall is the time to plant cool weather veggies! 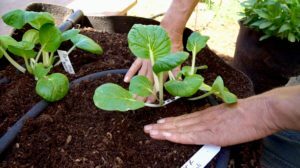 Fall Gardening: Cool Weather Veggies – What are They and How to Plant? As the summer warm weather crops are winding down, the chill of the Fall air doesn’t mean gardening season is over. It’s a lot of fun to keep the garden going as long as possible! This is the time of year to plant some vegetables that like the cooler weather. What are cool weather vegetables? Cool weather vegetables are simply vegetables that grow best in the cooler weather, 75 degree F or colder. If you’re concerned about your veggies getting frozen in the winter, there several types that will survive and even thrive in frost conditions, such as root vegetables, lettuce, kale and other types of greens. Veggies like lettuce, greens, broccoli, peas, cabbage, radishes, carrots, and brussel sprouts love the cool weather and are ideal for a fall garden. Smart Pots long fabric raised bed is a quick way to grow a Fall garden. For my Fall garden, I am growing AAS winners. I chose compact varieties, that can be grown in container or in ground. These varieties are vigorous growers and quick producers so I’ll have plenty to harvest before cold weather hits. AAS Winner varieties are vigorous growers and very productive. All America Selections (AAS) is a non-profit organization that has been around since the 1930’s. Its mission is to promote new, top performing garden varieties. These new garden varieties go through a series of impartial trials where they are grown and assessed against other similar varieties (that are already on the market) at trial gardens all across north America. The new seed varieties that perform best in the trial gardens are deemed winners and receive the title AAS winner. Bopak Pak Choi – tender, sweet and crisp. Tender, crisp and sweet, Bopak Pak Choi can be harvested as a baby green about 5 days earlier than other varieties. It can also be grown to a full sized head. It’s delicious in Oriental recipes, salads, soups and stews. Bopak is a stunning plant, compact, perfect for containers, grows in upright habit and can be planted densely if you have limited space in your garden. Artwork Broccoli bolt resistant and a quick producer. 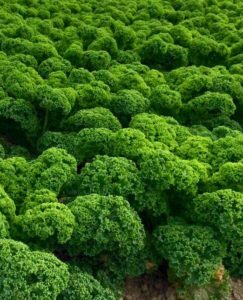 Artwork Broccoli is a compact plant that is bolt resistant. This means you can harvest it over a longer period of time before it bolts, flowers and goes to seed. It is quick producing, going from transplant to harvest in about 55 days. After the main crown is harvested, it will continue to produce side shoots that can be harvested all season long. 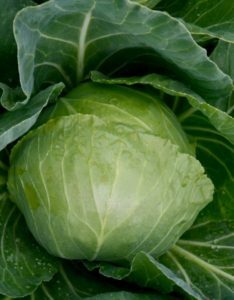 Katarina Cabbage – compact heads – perfect for container growing. If you think you’re not a cabbage lover, you’ll want to plant Katrina Cabbage! It’s sweeter and smaller that other varieties, with just 4 inch heads – perfect for container growing! The heads mature quickly, going from transplant to harvest in about 45 days, making them ideal for gardeners with a short growing season – or if cold weather is headed your way soon! 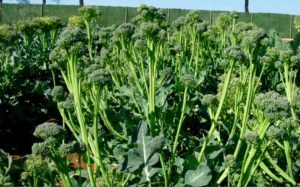 Prizm Kale has delicious nutty flavor and grows back quickly after harvest. If you want to grow kale, but think you don’t have room, Prizm Kale is the variety for you! It has short, tight, ruffled leaves, perfect for containers. It has a nice nutty taste, and as soon as you harvest the leaves, new leaves grow in very quickly. Kale is super hardy, holding up to both frost and heat like a champ! Mizuna Red Kingdom is a garden stunner! A Japanese mustard green with stunning red leaves – a perfect “ornamedible”! Besides being absolutely gorgeous, this plant is super hardy, bolt resistant, and holds up well to heat and frost. 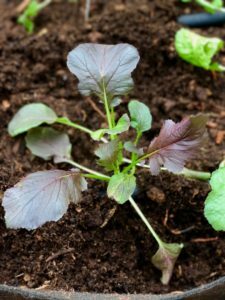 Mizuna Red Kingdom is a vigorous grower, the leaves are flavorful, mild tasting and delicious in a stir fry, or a salad. Radishes add a peppery zip to your salad. Sweet Baby Radish is a gorgeous purple/white/rose colored radish, and is crisply, crunchy and slightly spicy. It is quick growing, going from seed to harvest in 45 days. I love the peppery zip radishes add to a salad! This is the quickest growing variety of radish I have ever planted, going from seed to harvest in about 20 days. Kids will love to plant these, because they can almost see them grow! Roxanne grows well in a variety of climates. In mild winter climates, seeds can be planted every few weeks for a continual harvest. Another quick grower, Rivoli Radishes grow to a uniform size of about 1 1/2 inches in diameter. They have a nice, mild flavor, and are amazingly tasty when picked young, but will retain their delicious flavor when they sit in the garden longer, unlike some other varieties. 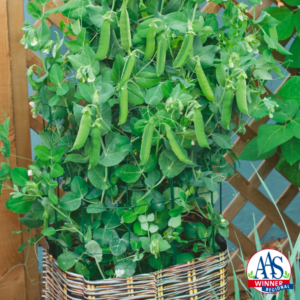 Patio Pride Pea plants grow to just 6-8 inches and are perfectly suited for container growing. One of my all-time favorite veggies, my fall garden wouldn’t be complete without sweet peas. This compact beauty grows to a height of 6-8 inches – perfect for a small space garden. It goes from seed to harvest in just 40 days. The sweet pods are very tender when harvested early and delicious for snacking on right in the garden. Don’t be surprised if these peas never make it inside! Fall garden seeds can be started under grow lights indoors to give them a quick start. I got off to a quick start with my fall garden by starting seeds in indoors in peat pellets using indoor grow lights. This provides a more controlled environment so that the seedlings grow stronger faster and I can get them outside in my garden as soon as possible. This also allows me to start cool weather veggies indoors when it is still too hot to grow them outside. If you are growing a FALL garden, make sure to check out All America Selections for more information about these and other top producing varieties. Their website also has a list of seed distributors where you can purchase seeds. If you’re a northern gardener and don’t have enough time left in the growing season to grow cool weather veggies outdoors, no worries. I’ll also be doing a series on indoor gardening. Stay tuned! Watch the video from my YouTube channel, “Fall Garden – Cool Weather Veggies, What they are and How to Plant Them” so you can see exactly how to get your’s planted! While you are there, subscribe and hit the bell icon so you get notifications when I posting update videos! Comment below, let me know if you’re growing a FALL garden and what you are growing! Thanks to All America Selections, Smart Pots and Good Dirt for providing the supplies for my FALL garden and for teaming up with me on the “Fall Garden” series. I think I will plant lettuce,radishes and carrots. Those veggies will do well in the cold – especially the root veggies. If you are expecting extended hard frosts, mulch heavily and cover your plants with something, like a blanket or thick plastic, especially at night. This will help them survive the cold, and help you have more tasty, fresh veggies to eat! Thank you for stopping by the blog – appreciate it! I live in Southern California. I’ve planted carrots, onions, tomatoes, lettuce, and two mini grape vines. I still have zucchini, pattie pans, Swiss chard, watermelon, bell peppers that I’m harvesting. Saving my seeds for next year too. You helped me save my watermelon plants by recommending the mint spray thank you. Also used your advise and wrapped my watermelon fruit with towels every night which saved them from the predators. Thank you my gardener friend. 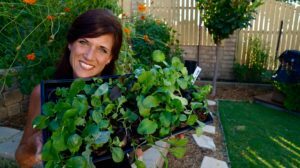 Hello Janice – Love the veggies you have growing – it’s so wonderful to be able to grow year round here in So Cal, isn’t it? And saving seeds is the best – free plants. Way to go! So glad you are enjoying the videos and blog posts and that they are helping you grow more of your own food to share with those you love. Thanks for stopping by to visit and share! Hi Calikim, im growing turnips zucchini,pumpkins green yellow peae tomato brandywine tomato. Cayenne pepper brown sweet peppers green peppers, cucumbers . I love it. Thanks for everything. Hello Janita – wow, you have an amazing variety growing! You must live in a warm climate like I do. Isn’t the fresh food from the garden so tasty? Thanks for stopping by to visit! Hi Kim. Thank you and camera guy for you videos. I live in GA and it’s still pretty hot here. I still have tomatoes, cucumbers, papers growing. I have lettuce, carrots, radish seeds I’m about to direct sow. And within the next week or two in going the get cabbage, collards, broccoli seedlings to transplant. Also putting onions and garlic out. Again thanks for all the info you’ve provided, I really appreciate it. It’s so fun to see the late summer garden still going strong! And then to transition over to the cool water veggies is a treat. I actually just posted a video on YouTube over the weekend about transitioning a garden bed, here’s a link if you haven’t seen it yet, https://www.youtube.com/watch?v=IVw13OO5TQ4&list=PLH4z_9MDD00J_cWhelfl2KOz5yah7NIRP&index=4. Glad you are enjoying our content – we love to share what we are passionate about with others. Happy Gardening! How amazing that you are growing peppers – bet you can’t wait to harvest! It’s always fun to spend a day off working in the garden, isn’t it? I like to call it garden therapy! So sorry you haven’t received your ebook yet, usually it is sent immediately. Check your junk folder (esp with gmail) and if you still don’t see it, email me at calikim@calikimgardenandhome.com and I’ll get a new link to you. Thanks for visiting me here and enjoy your day off! some unexpected physical problems ended my fall plantings but haven’t stopped my pencil and paper from working on placement and supplies for the spring planting. i will be looking forward to your videos on seed starting to transplanting to growing to harvest in 2018. you have the best videos i have seen, very helpful. So sorry to hear about your physical problems – sure hope they improve soon. Good for you for not letting it stop you from planning for your spring garden! 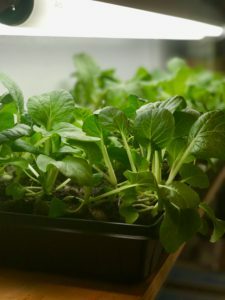 In the meantime, have you ever considered growing a simple indoor garden so you have some fresh food to harvest in the cold months? In case you haven’t seen it yet, here is a link to my “Growing Your Indoor Garden” series I did last year, https://www.youtube.com/playlist?list=PLH4z_9MDD00JC763unx7ey86F20D0Gnep. Thanks so much for stopping by to visit me here! Hi Kim, without your advice on growing a summer and fall Garden I would not today have my traveling mini garden In grow bags! I am so hooked on growing when ever I can in my baby space, I cannot read enough on what I’m growing. thank you for all the advice you are the best. It’s so convenient to grow in grow bags so you can just move them around to chase the sun or shade. So glad the videos and blog posts have helped – even in a small space, you can grow your own food – great job! Thanks so much for stopping by to visit! Hello Benjamin, the cool weather crops are so much fun to grow. Kale is both heat and cold tolerant, you’ll love growing it! 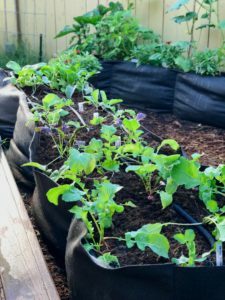 I’ve used the Walmart bags to grow in also – a great way to grow on a budget for sure! If you can work a few Smart Pots containers in to your budget, they are very reasonable and last forever. Thanks so much for stopping by to visit me on the blog! Glad you have some containers still going. 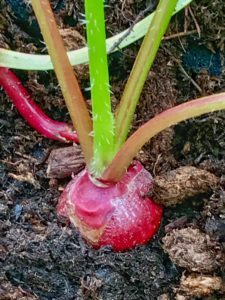 Often root veggies will overwinter beautifully, as long as you apply some shredded leaves for mulch to keep them nice and cozy all winter. Mizuna Red kingdom is a new favorite of ours, so beautiful. Thanks for visiting me here on the blog! They are very convincing and will certainly work. Nonetheless, the posts are very brief for starters. I have enjoyed watching your show been watching for years now. I have planted my seeds from the Fall seeds you sent me I started them yesterday for Fall. This will be my first Fall Garden. Despite all the rain we are getting this year here in Virginia, I am enjoying tomatoes, peppers, and strawberries this year. I am about to harvest some egg plants, cucumbers and zucchini. Tell camera man, I appreciate him too he did good planting the Fall seeds. I am using smartpots, tower garden, and vegepod. Just received my vertical tower from Gardeners Supply Company, I have not planted anything in it yet bet I will probably put some carrots and beets in there. Thank you. So happy you’ve received your seeds and will be planting them soon. It’s so rewarding to get those tasty harvests from the garden and such a feeling of pride knowing you grew it yourself! Congratulations on your hard work, the garden is giving back to you. Thanks for stopping by! Thanks for stopping by ?? ?